(लेजर द्वारा टेलिस्कोप के गाइड कइल जाला). ↑ Gerhard, O. (2002). "Mass distribution in our Galaxy". Space Science Reviews. 100 (1/4): 129–138. arXiv:astro-ph/0203110. Bibcode:2002SSRv..100..129G. doi:10.1023/A:1015818111633. ↑ Frommert, Hartmut; Kronberg, Christine (अगस्त 26, 2005). "Classification of the Milky Way Galaxy". SEDS. पहुँचतिथी 2015-05-30. ↑ Hall, Shannon (2015-05-04). 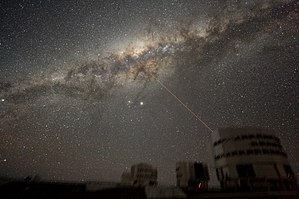 "Size of the Milky Way Upgraded, Solving Galaxy Puzzle". Space.com. पहुँचतिथी 2015-06-09. ↑ Coffey, Jeffrey. "How big is the Milky Way?". Universe Today. ओरिजनल से सितंबर 24, 2013 के पुरालेखित. पहुँचतिथी November 28, 2007. ↑ Rix, Hans-Walter; Bovy, Jo (2013). "The Milky Way's Stellar Disk". The Astronomy and Astrophysics Review. 21. arXiv:1301.3168. Bibcode:2013A&ARv..21...61R. doi:10.1007/s00159-013-0061-8. ↑ "NASA – Galaxy". NASA and World Book. Nasa.gov. नवंबर 29, 2007. ओरिजनल से अप्रैल 12, 2009 के पुरालेखित. पहुँचतिथी दिसंबर 6, 2012. ↑ Staff (दिसंबर 16, 2008). "How Many Stars are in the Milky Way?". Universe Today. मई 2, 2010 के ओरिजनल से पुरालेखित. पहुँचतिथी अगस्त 10, 2010. ↑ Odenwald, S. (मार्च 17, 2014). "Counting the Stars in the Milky Way". The Huffington Post. अगस्त 1, 2014 के ओरिजनल से पुरालेखित. पहुँचतिथी जून 9, 2014. ↑ H.E. Bond; E. P. Nelan; D. A. VandenBerg; G. H. Schaefer; आ अन्य. (February 13, 2013). "HD 140283: A Star in the Solar Neighborhood that Formed Shortly After the Big Bang". The Astrophysical Journal. 765 (1): L12. arXiv:1302.3180. Bibcode:2013ApJ...765L..12B. doi:10.1088/2041-8205/765/1/L12. ↑ McMillan, P. J. (जुलाई 2011). "Mass models of the Milky Way". Monthly Notices of the Royal Astronomical Society. 414 (3): 2446–2457. arXiv:1102.4340. Bibcode:2011MNRAS.414.2446M. doi:10.1111/j.1365-2966.2011.18564.x. ↑ Karachentsev, Igor. "Double Galaxies §7.1". ned.ipac.caltech.edu. Izdatel'stvo Nauka. पहुँचतिथी 5 अप्रैल 2015. ↑ Gillessen, S.; आ अन्य. (2009). "Monitoring stellar orbits around the massive black hole in the Galactic Center". Astrophysical Journal. 692 (2): 1075–1109. arXiv:0810.4674. Bibcode:2009ApJ...692.1075G. doi:10.1088/0004-637X/692/2/1075. ↑ Sparke, Linda S.; Gallagher, John S. (2007). Galaxies in the Universe: An Introduction. प. 90. ISBN 9781139462389. ↑ 15.0 15.1 Gerhard, O. "Pattern speeds in the Milky Way". arXiv:1003.2489v1. ↑ Kogut, A.; आ अन्य. (1993). "Dipole anisotropy in the COBE differential microwave radiometers first-year sky maps". The Astrophysical Journal. 419: 1. arXiv:astro-ph/9312056. Bibcode:1993ApJ...419....1K. doi:10.1086/173453. ↑ 17.0 17.1 Kafle, P.R. ; Sharma, S.; Lewis, G.F.; Bland-Hawthorn, J. (2014). "On the Shoulders of Giants: Properties of the Stellar Halo and the Milky Way Mass Distribution". The Astrophysical Journal. 794 (1): 17. arXiv:1408.1787. Bibcode:2014ApJ...794...59K. doi:10.1088/0004-637X/794/1/59.